Yesterday we learned a hard lesson: Never eat these before and interval workout. Don’t get us wrong, these are really, really good. They have a fabulous texture, and amazing flavour, but they just don’t sit well when you try and run your brains out in 35 degree weather. Beans + workout = bad call Julie and Brittany. Oh well, live and learn. And lets be real we only regret eating them a little bit – they were so yummy! In a large bowl, mash chickpeas until they reach a past-like consistency with a few chunks. Add all other ingredients and stir until fully incorporated and everything is evenly combined. Heat some coconut or olive oil in a non-stick frying pan over medium-high heat. Using a 1/2-cup at a time, form the mixture into patties. Place in the frying pan and cook for 5 minutes on each side, or until heated through and the outsides are slightly crispy. What kinds of foods do you like to make big batches of to freeze for later? 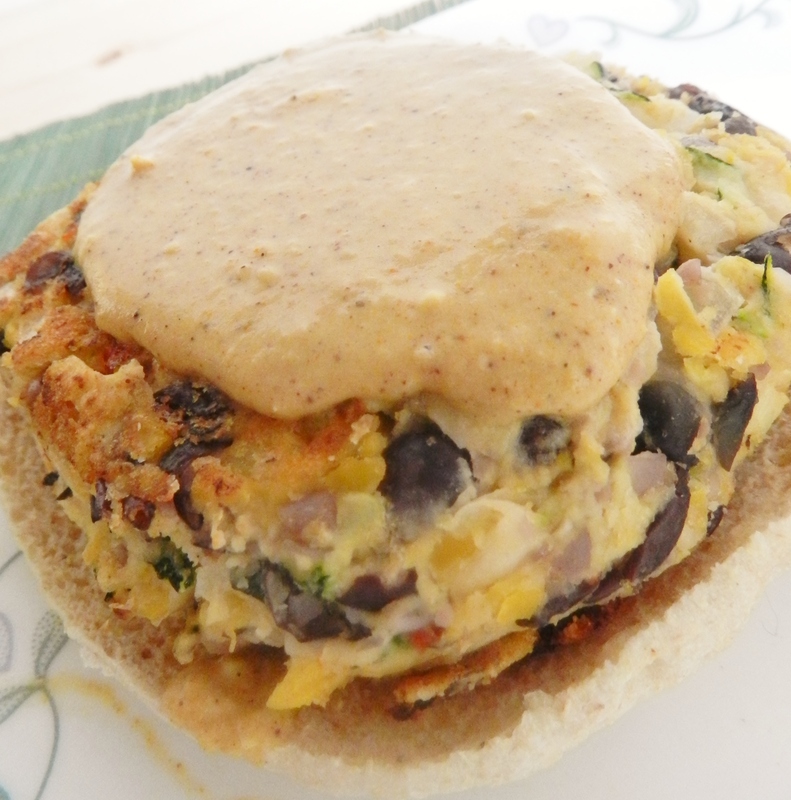 Have you ever eaten something that didn’t sit well for a workout later on? 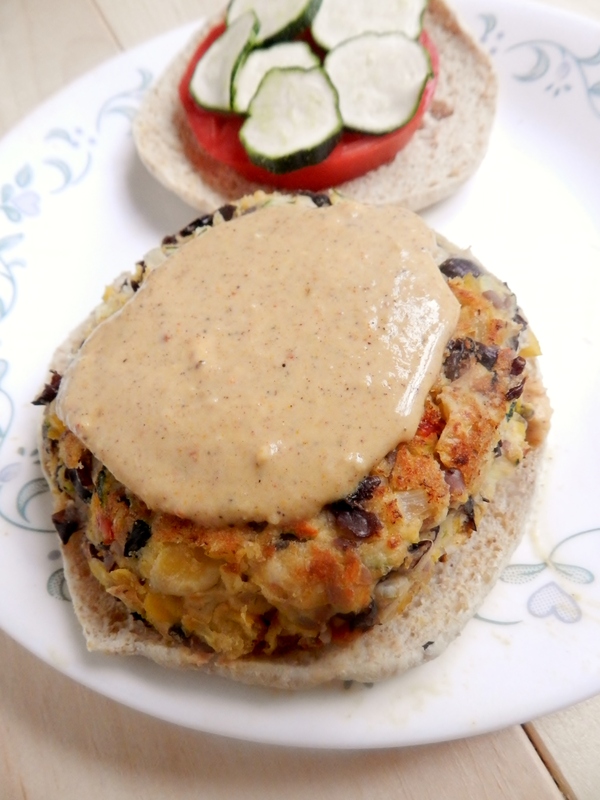 Posted in Uncategorized and tagged burger, chickpeas, dinner, easy, healthy, lunch, peanut butter, quick, Szcechuan, vegan, vegetarian. Bookmark the permalink. You know the kind where you just can’t seem to think of anything that gets your appetite going, and yet everything you eat turns out to be incredible! It ended with a good ol’ basket of fish n’ chips (healthy of course!) with an out-of-this-world peach dipping sauce. We promsie we won’t keep that recipe from you for long! But yesterday, it was lunch that was the real test. 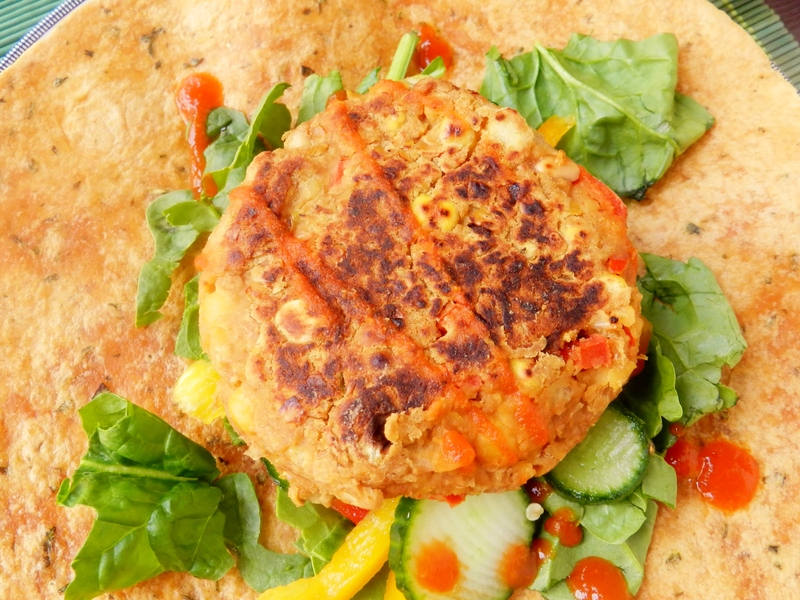 We couldn’t think of anything to make, and yet we came up with one of the most delicious vegetarian burgers we have ever made! 1. open the fridge and find chickpeas and black beans. Can’t decide which ones to use. 2. Decide to use both. 3. find ourselves unable to ignore the giant pile of zucchini on the counter. 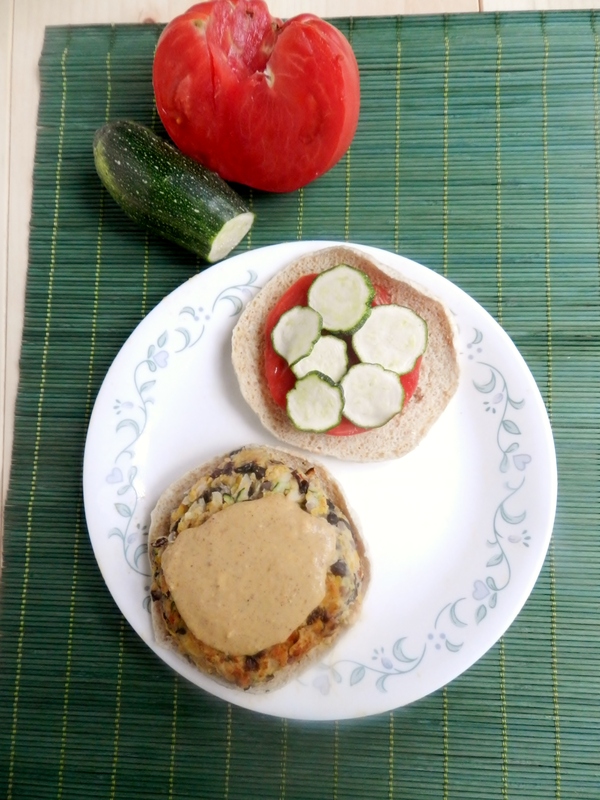 So there’s not really a connection between grated zucchini and burgers, but that’s where our thought process went anyways, and are we sure glad it did! The rest of the procedure was just an exercise in gluing. 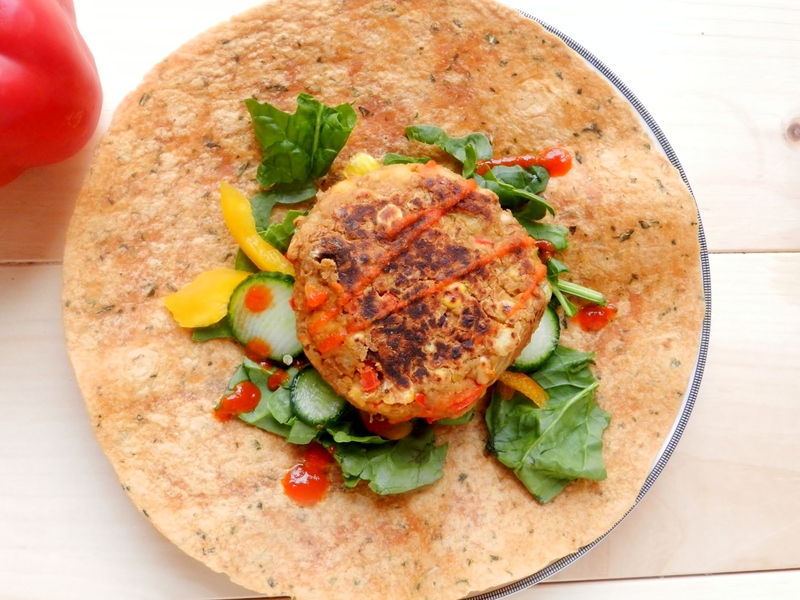 Vegetarian burgers are actually quite easy to make, but the tricky part is making sure that they stick together in the pan. No one wants a crumbly burger! 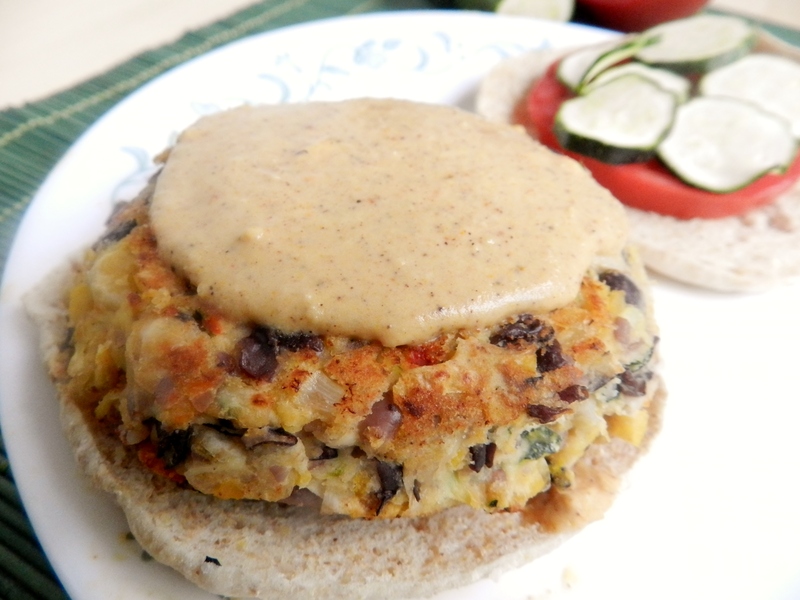 And of course, every veggie burger needs a delicious sauce. In this case, hummus came through for us once more! 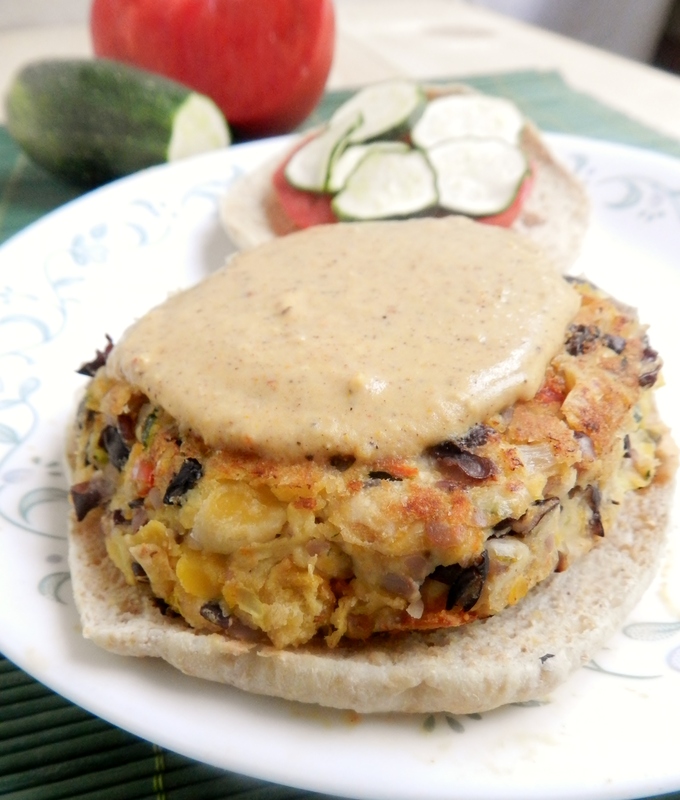 A smooth and creamy Berbere-Hummus sauce adorned this delicious creation. We got the idea for the Berbere-spiced hummus sauce from here. We made that recipe a few days ago, and LOVED it! 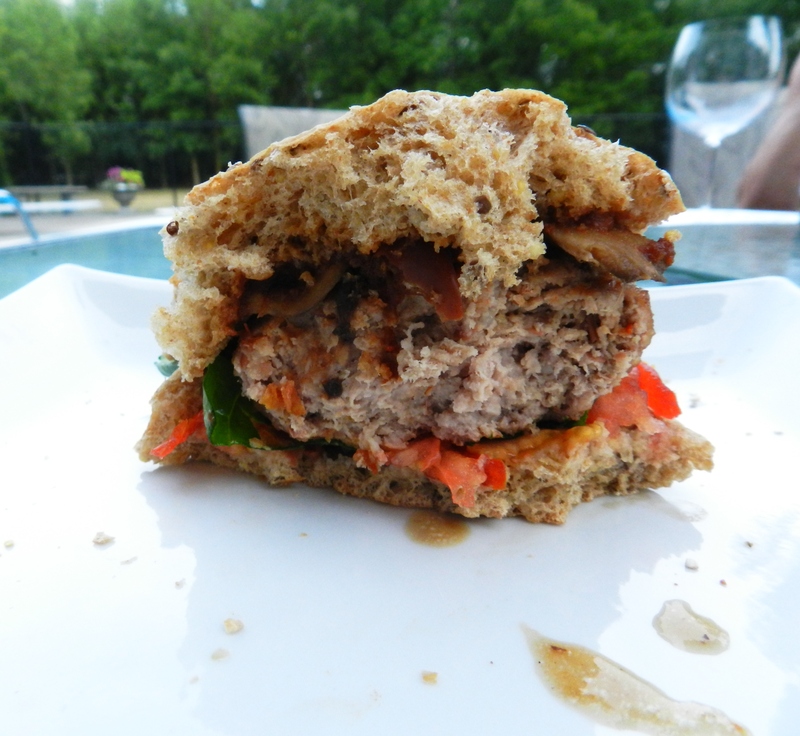 We had a bunch of leftover spice mix, and thought it would be awesome as a sauce for these burgers. We were right. So here’s what we did for the sauce: mixed a 1/4 c. of our favourite hummus with 1 tbsp of this Berbere seasoning, and added 2 tbsp of water to thin it out and give it a more sauce-like consistency. 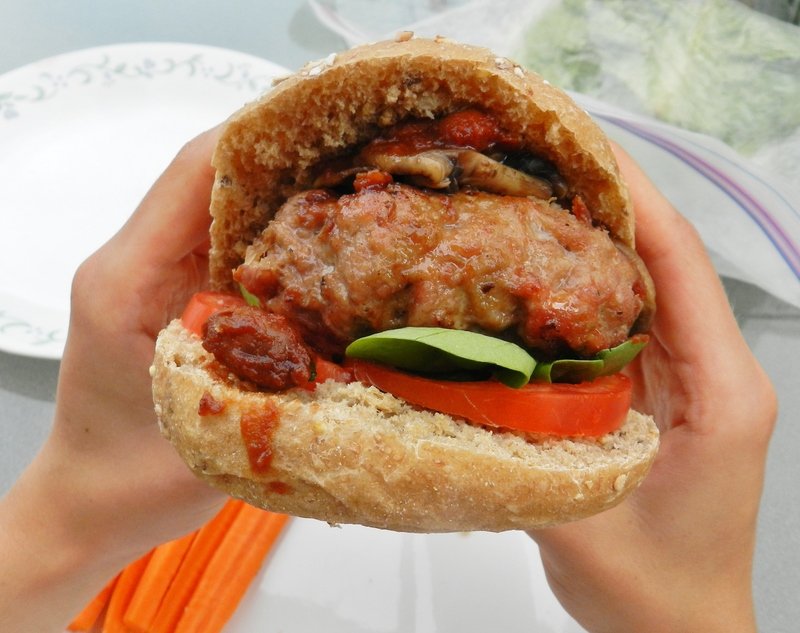 From the burger to the sauce, this recipe is so simple, so quick, and so delicious. In a medium-sized bowl, mash the beans together, leaving a few larger pieces for texture. Add all other ingredients and mix together until the mixture comes together when packed. 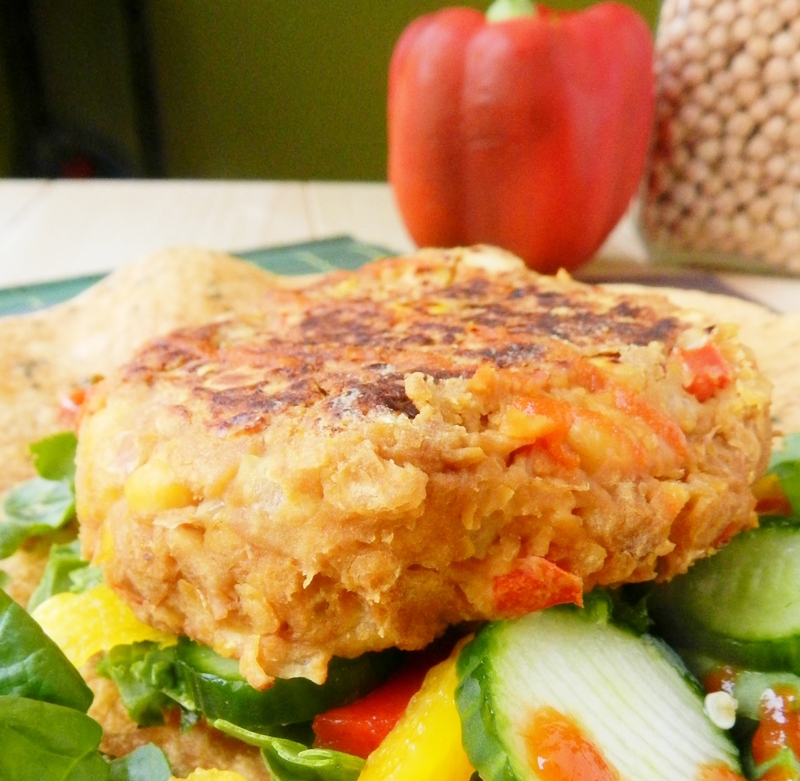 Separate mixture into 2 equal-sized portions and form into patties. Wet your hands to avoid having it all stick to your fingers! Heat a pan with a little olive oil. 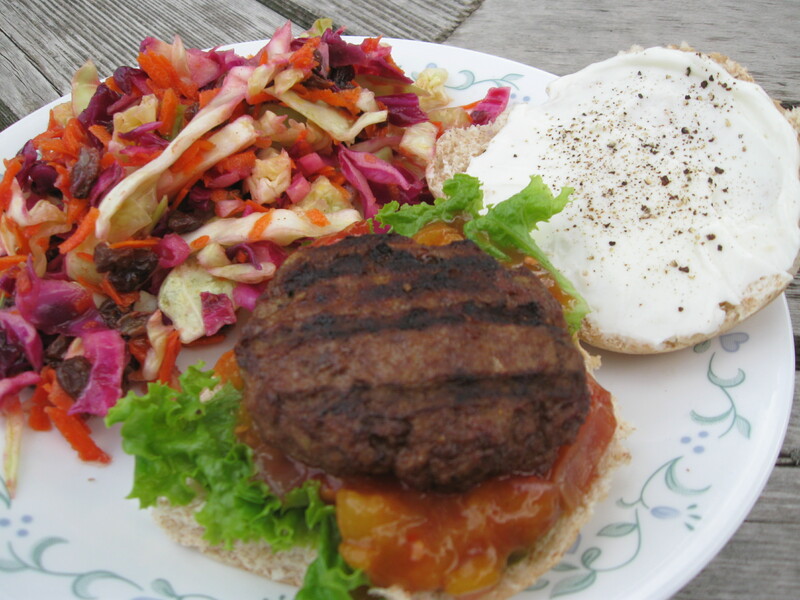 Carefully place burgers onto the pan and cook for about 5 minutes, or until browned. Carefully flip over and cook for another 5 minutes. 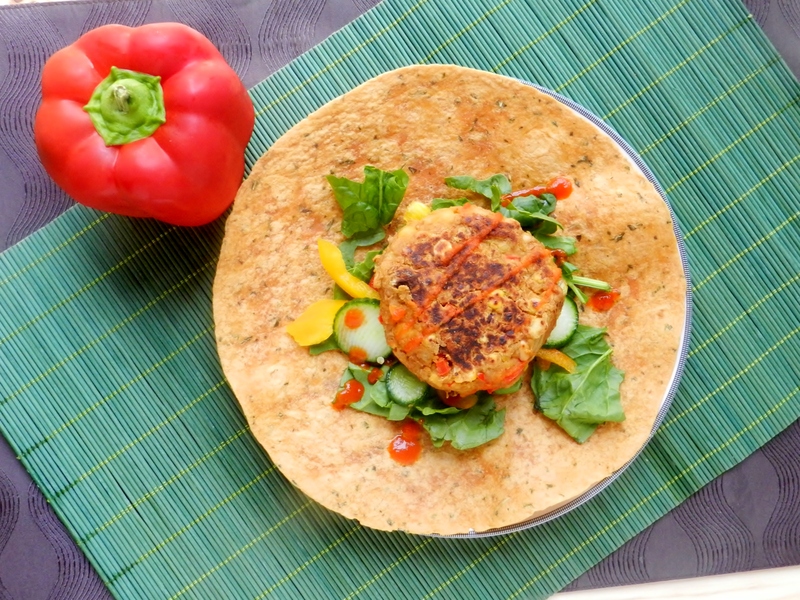 Do you like vegetarian burgers? What do you do when you can’t decide what to eat? 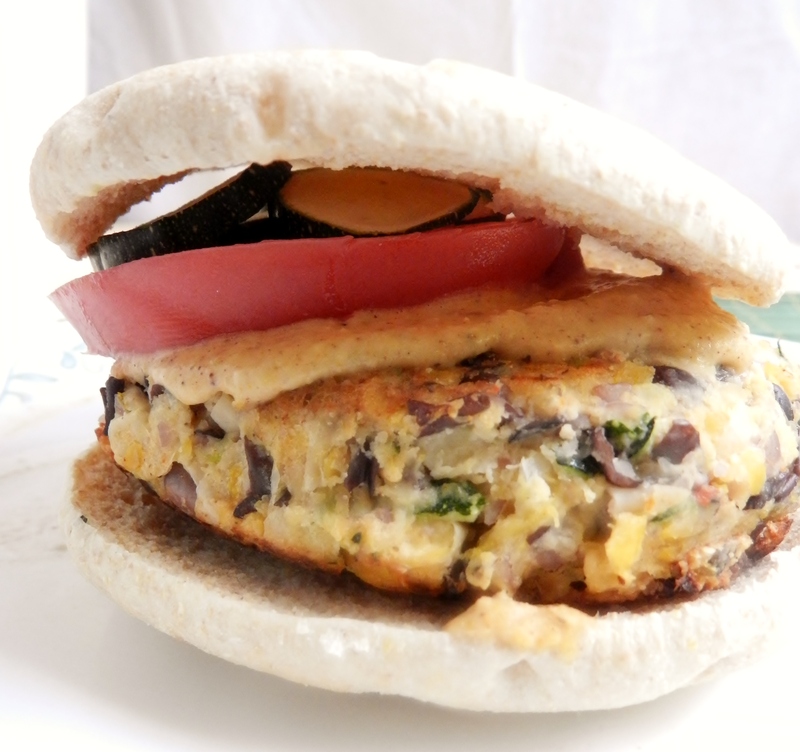 Posted in Uncategorized and tagged black beans, burger, chickpeas, dairy free, easy, egg-free, fibre, gluten free, healthy, lunch, protein, quick, vegan, vegetarian, zucchini. Bookmark the permalink. Of course, we really like the bean part, better. Actually, we’d prefer the beans sans-pork. You see, we’re not really pork people. We don’t like bacon, and we find pork often has just too much blubber, even the lean cuts. But then, we had a brain-wave! What’s the best way to have meat? In a burger, of course! 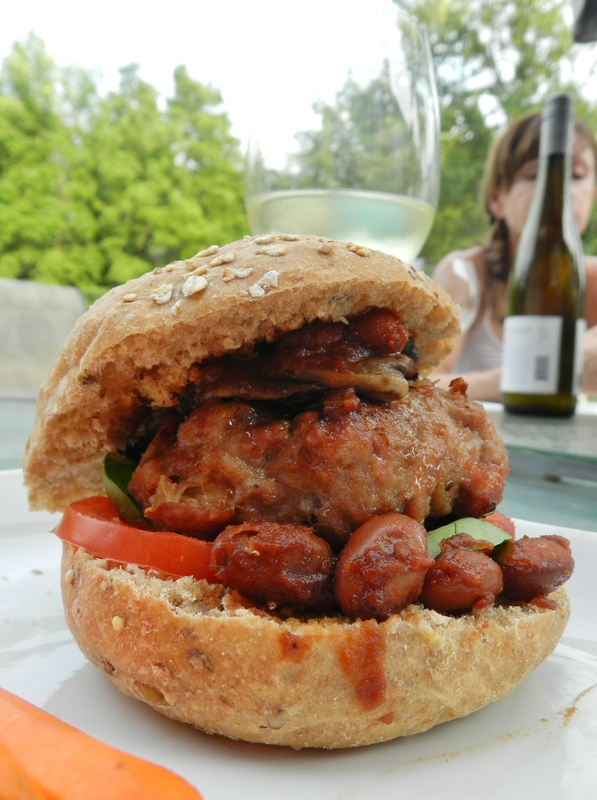 A Pork n’ Beans burger. De-ee-licious! First, let’s talk about the beans. They were sweet, savoury, tangy and rich, while still being entirely healhy, not full of the added salt and sugar of canned baked beans. They were so buttery tasting, it was heaven! Not to mention they are really easy to make. 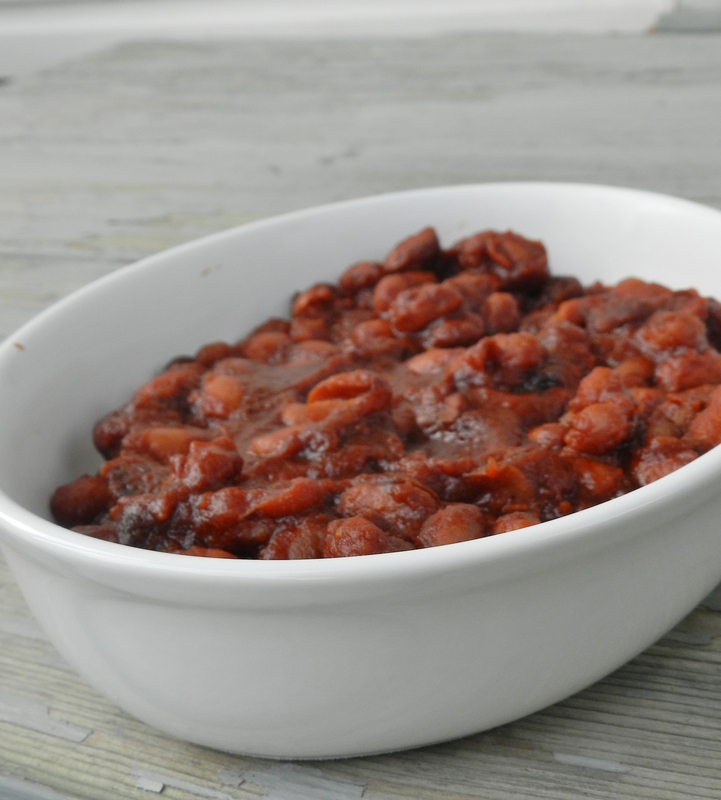 Toss everything in the slow cooker at noon and you’ve got delicious beans by dinner. These were so friggin delicious- we wished we had made at least a quadruple batch of them! We’re pretty certain that we could’ve polished off four times the amount we made between just the two of us. They were that good. Put all ingredients into the slow cooker and stir to mix evenly. Cook for 2 hours on high and then 2 hours on low. And now to the burgers! Oh baby! Now this is how pork should be eaten. As it is obvious, we enjoyed these burgers pool-side. 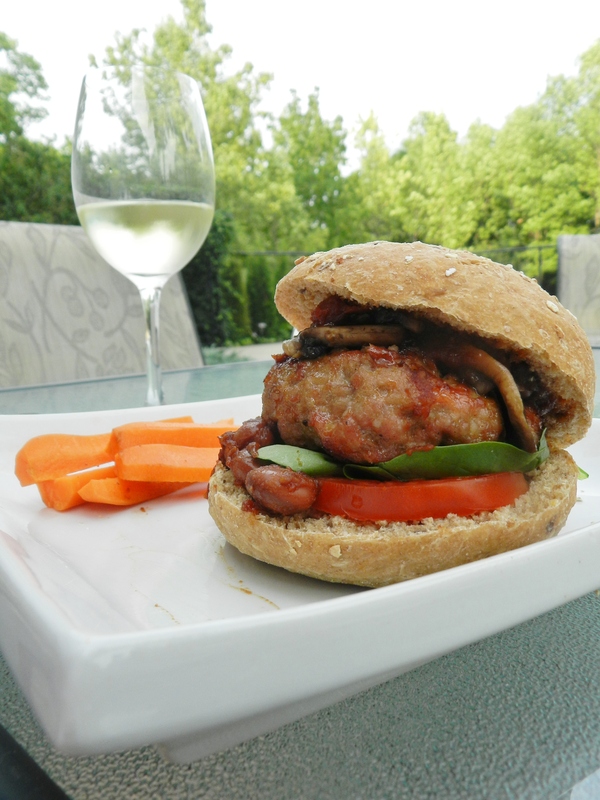 Is there really any other way to have a burger in the summer? 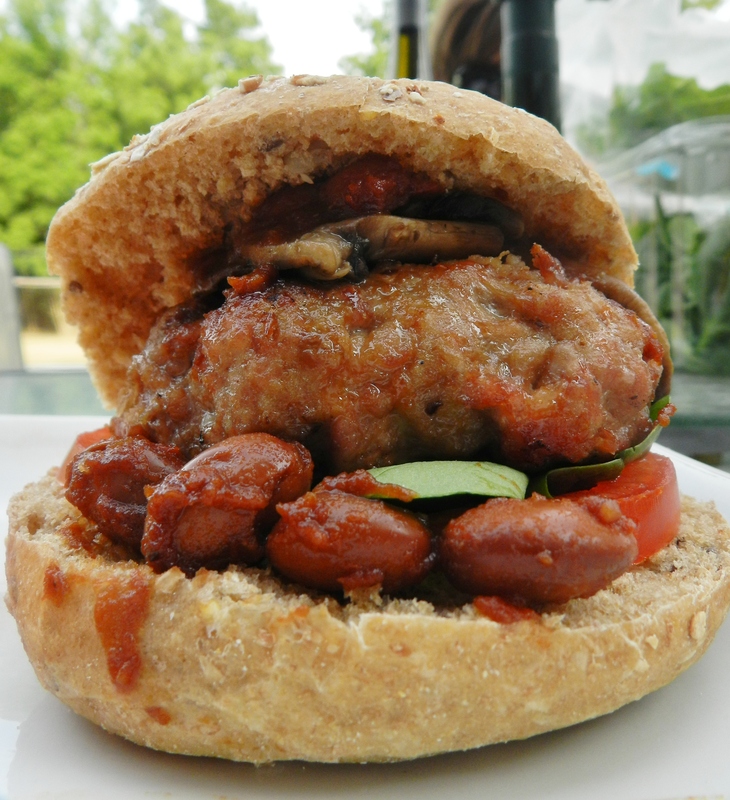 These burgers are great because they are purely meat and beans, with some extra ingredients for flavour. No eggs, no breadcrumbs. 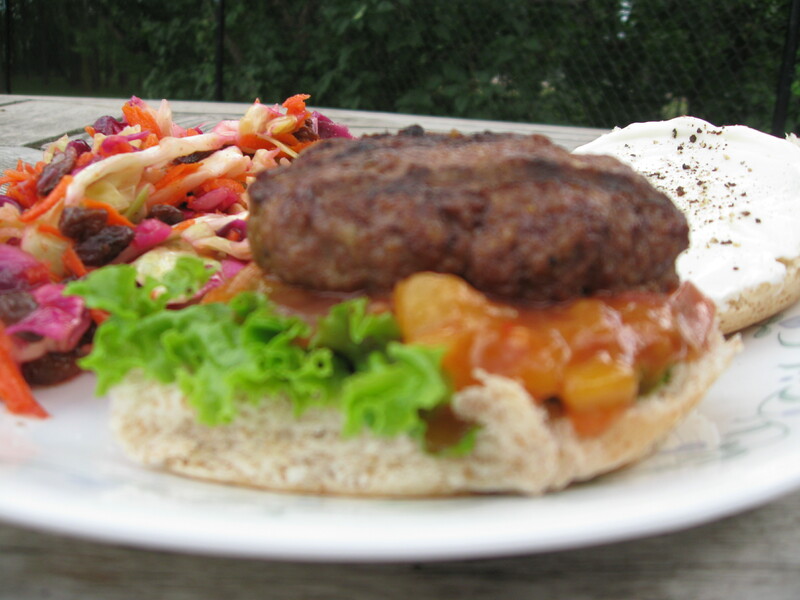 We are able to do this because of the same burger trick that we used when we made the Curry Burgers. 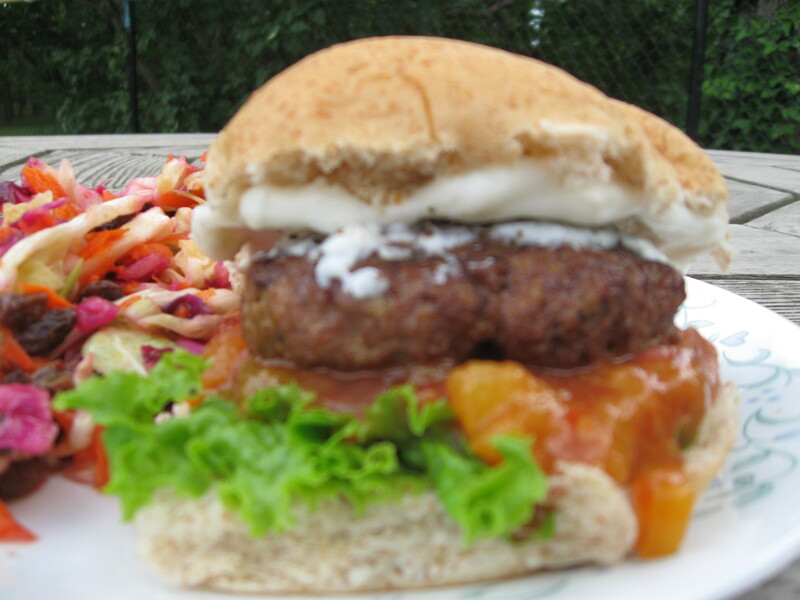 With this trick, our burgers never fall apart on the grill! The trick? Blend half of the meat (and beans, in this case) in the food processor, making a paste-like mixture that acts like glue to keep the burgers together. You then add the rest of the meat and slightly mashed up beans to the paste by hand. 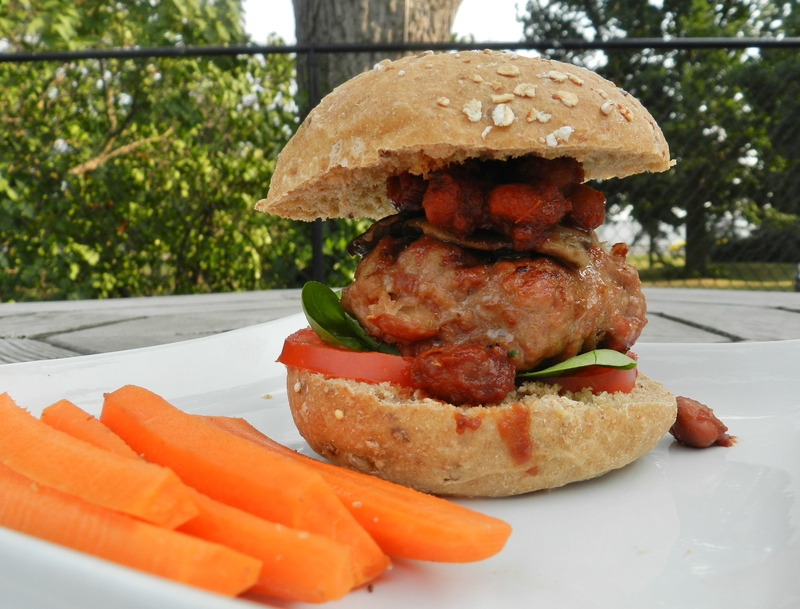 We weighed the batter, and figured out that using 2lbs of ground pork and one can of beans, each patty should weigh 5.5 – 5.6 ounces. This gave us ten big, delicious burgers. Leftovers, anyone? 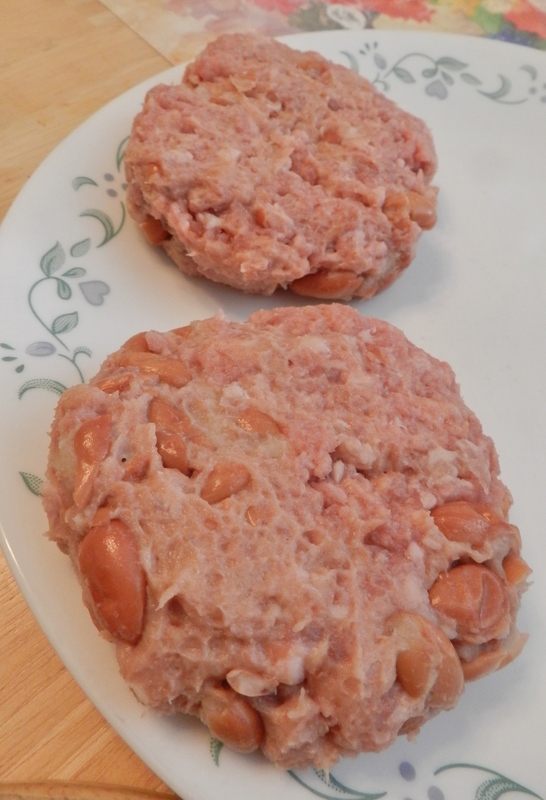 In the food processor, blend 1 lb of ground pork, 2/3 of the can of beans, the molasses, worchester, maple syrup, and garlic until you have a sticky paste. In a large bowl, slightly mash up the remaining beans. 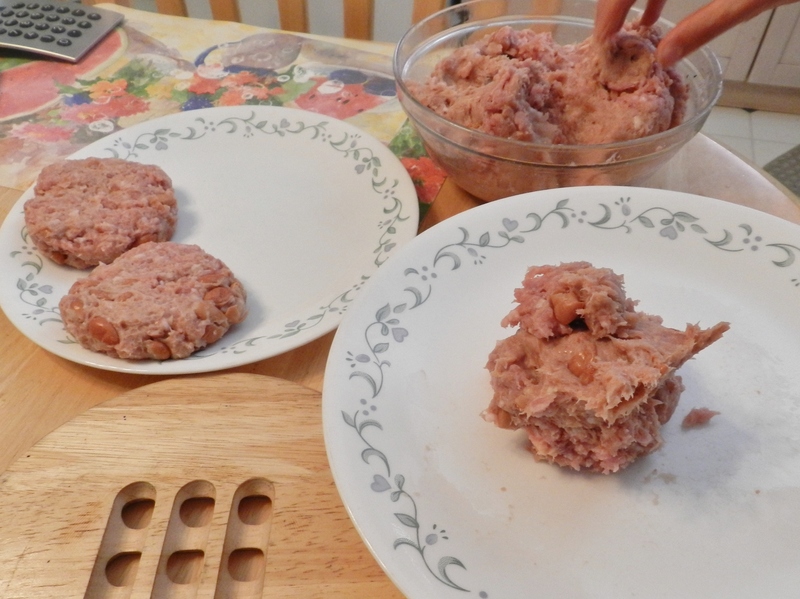 Add the other pound of pork, along with the meat and bean mixture and mix together with your hands. Grill on low for 45 minutes, or until cooked through. 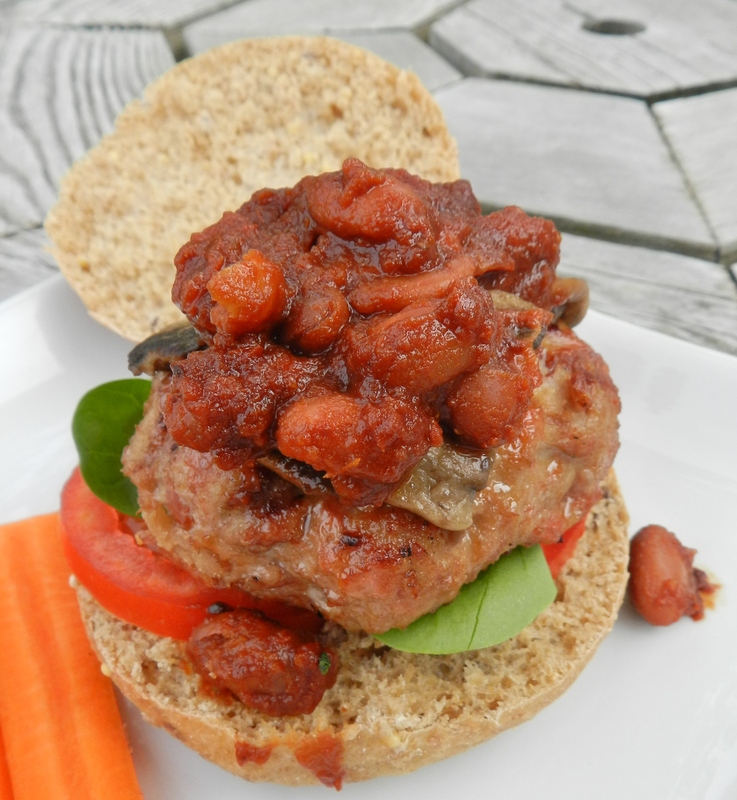 Top with slow-cooker baked beans, and any other toppings you desire! 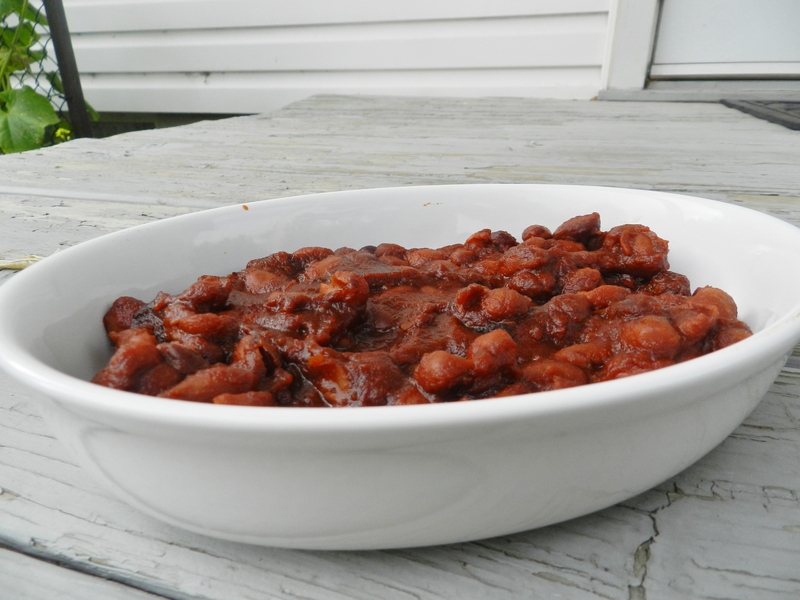 Do you like pork and beans? What’s your favourite way to eat them? 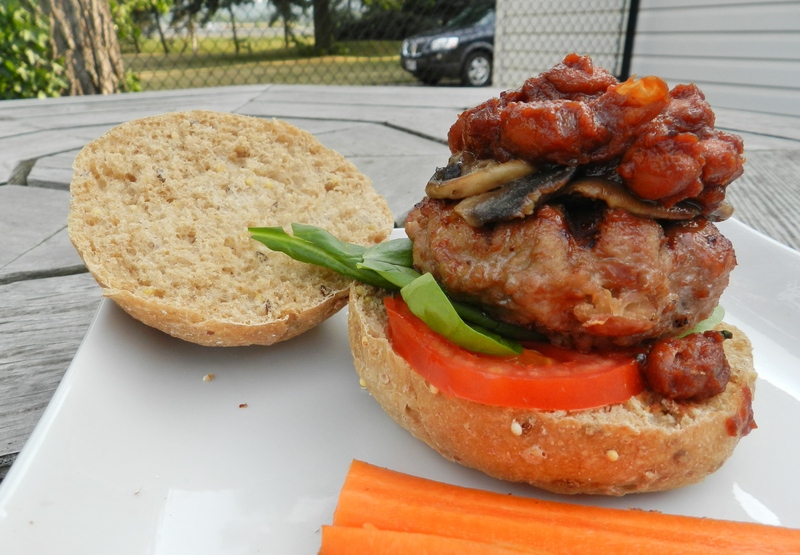 Posted in Uncategorized and tagged barbecue, beans, burger, grill, healthy, pork, slow cooker, summer. Bookmark the permalink.